A ride on a bicycle cab through the city, a beautiful group picture as a souvenir, making an appearance on the big screen, free Skype session with the home front from the delightful town centre in Malmedy, La Roche-en-Ardenne or Stavelot. 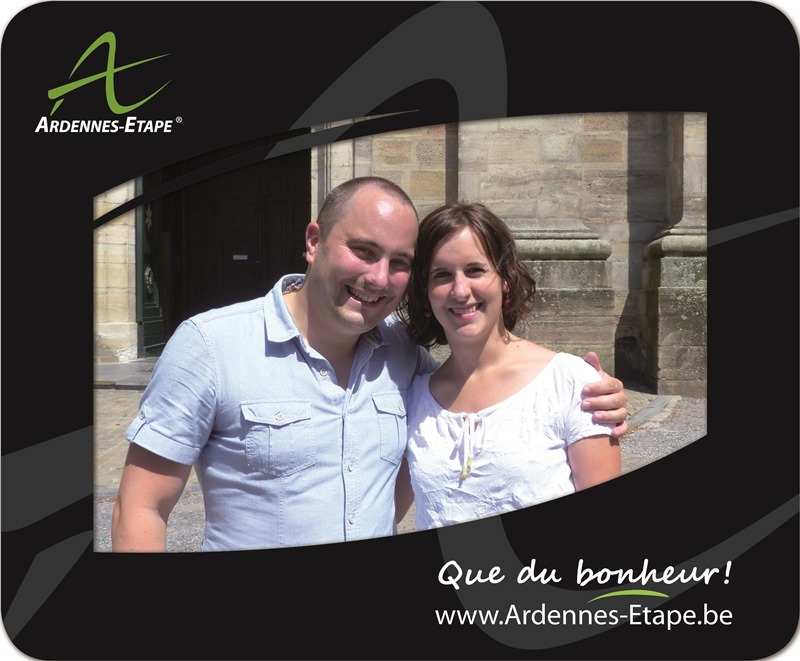 Visiting the Belgian Ardennes this summer: that’s technology, service and amazing memories. Every year Wallonia is worth 8.5 million overnight stays, welcoming a total of over 9 million holiday-makers (source: CGT). They get to know the uniqueness of the Belgian Ardennes: breath-taking scenery, cosiness and lots of exceptional outdoor activities. Ardennes-Etape, market leader in holiday-home rental in the Belgian Ardennes, decided to take the ‘Ardennes experience’ to the next level. The joie de vivre, so typical for the region of the Ardennes, is presented to the world in real-time. 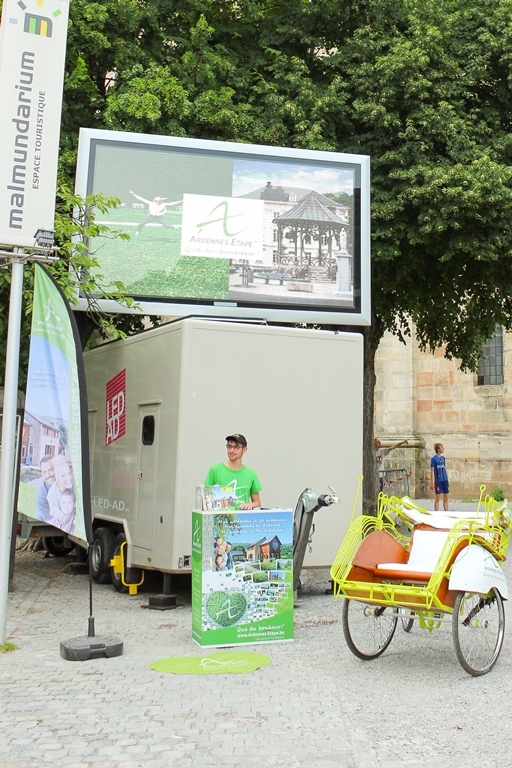 Holiday-makers having just visited the cathedral in Malmedy, the La Roche town centre or the Coo waterfall, get the chance from mid-July to mid-August to have their group photo taken and shown immediately on the 4-metre wide big screen. 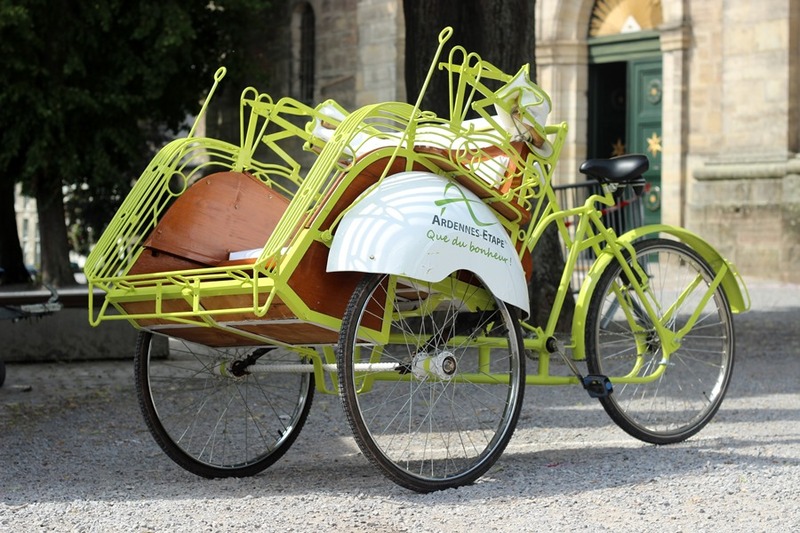 The next part of the experience consists of a ride through town on an authentic rickshaw. The bicycle cab is driven by an enthusiastic student worker. Tourists get an extraordinary impression of the delightful Ardennes city centres. The smallest museum in the world, the Place de Rome in Malmedy, the Coo waterfall, the American tank in La Roche and much more. 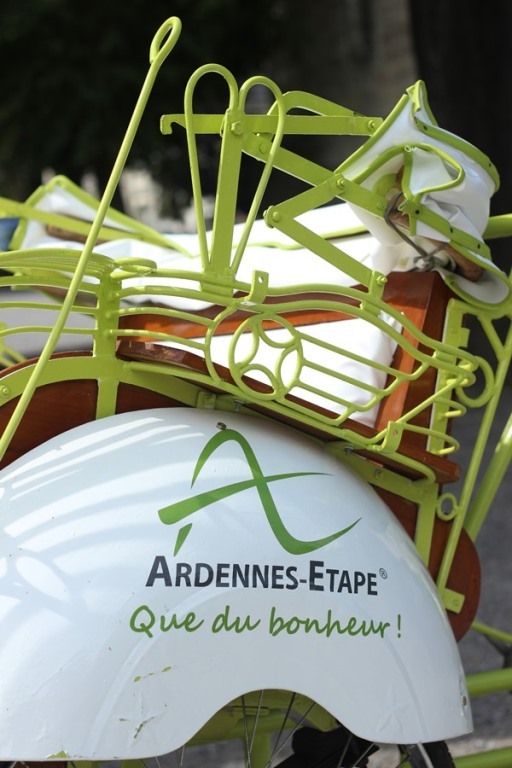 “The people spontaneously start talking to us: with questions, to take a ride on the rickshaw or even to offer us something to drink,” states Gilles, student-cyclist at Ardennes-Etape. Back at the photo stand, they receive their personal photograph, printed and inserted in a unique mouse mat. “The passers-by are pleasantly surprised by the concept. They absolutely love the pictures and praise the cyclists for their courage,” confirms Pierrine, student worker at Ardennes-Etape. Extra: there’s a free WiFi hotspot for everyone in the area. Posting the photos on social media is just a piece of cake. The 500 holiday-makers on site the weekend of 21 July indicated to be completely delighted by the idea! Have a look at the video…. For more information do not hesitate to contact Valérie Geron (FR-NL) on 080 29 24 00. This entry was posted in Press release and tagged accomodation, Ardennes, Ardennes-Etape, Belgium, for rent, holiday, holiday home, stay Belgium, where to stay by Ardennes-Etape. Bookmark the permalink.